Bharat Sanchar Nigam Limited (BSNL), India's Largest Broadband Service Provider, has launched "Facebook on USSD". Facebook without Internet will empower BSNL Customers to access the world's most popular social website - Facebook, without the need of a data connection. "Facebook without Internet" will leverage USSD as an access medium and will provide every BSNL mobile user direct access to their Facebook account to carry out primary Facebook activities like posting updates, finding friends and viewing feeds on their mobile phone. 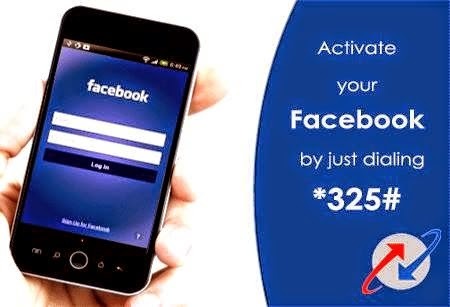 Dial *325# to Access your Facebook account without internet - Anywhere, Anytime". This service is available to all Prepaid and Postpaid customers in all the telecom circles in India. To activate these new Facebook services, BSNL Prepaid or Postpaid Mobile customers need not subscribe to any Prepaid or BSNL Postpaid Data Plans. Facebook on USSD can be activated by just dialing the USSD code *325# from mobile phone. Even handsets having no internet facility can be used to access this service. The service enables BSNL Customers to access their Facebook accounts, view / post status messages, respond to friend requests, write on friends' walls, view birthday reminders and send messages etc. These services are perfect for "always online customers" who want to stay in touch with their Facebook friends at anytime without any internet or data connection and that too at the lowest charges. Easier way of connecting with people, relatives, friends. Using Facebook chat over USSD. Roaming supported : We can use Facebook for USSD when you are on roaming. Customers will be able to directly access the different features of the service through these short cuts. Readers, How many of you are always connected with your Facebook friends all the day? Whether these packs will attract users who access Facebook through data plans? Have you tried this new service from BSNL? Please share your views with us.